I'm all for the exercise of free speech, but calling for the death of someone has never quite impressed me as the sort of speech that should be protected. Maybe this is because I have spent enough time working with emotionally troubled individuals to know that many do not need much prodding to go over the edge and engage in violent acts. Sure, most high-functioning people are going to be minimally susceptible to such speech, but they aren't the ones we need to worry about. There are enough emotionally disturbed people, those we might describe as high-risk, that I cannot help thinking that repeated calls for the death of someone are probably more dangerous than most people realize. Now, it is entirely possible that Rev. Anderson knows full well that his god is a sham and that his prayers have no effect. 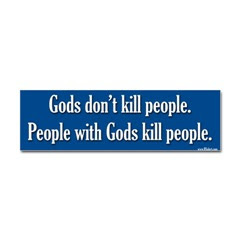 And yet, I don't think it is any sort of god that we need to worry about. What Rev. Anderson is clearly saying is that he would like to see the death of President Obama. Unfortunately, there are more than a few disturbed individuals out there who might interpret such statements as a command (or at least permission) from someone who knows the mind of a god. I join Americans United for Separation of Church and State in denouncing Rev. Anderson's calls for violence. I sincerely hope other religious leaders will do so as well. Disagreement is welcome (even encouraged), but the violent rhetoric has to stop before it motivates additional murders.